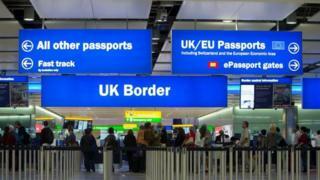 Net migration to the UK has dropped to 273,000 in the year to September, down 49,000 from the previous year. The fall is the first time net migration has dipped below 300,000 in two years and the lowest level recorded since June 2014. But it is short of the government’s target figure of under 100,000. The Office for National Statistics figures record the difference between the number of people coming to live in Britain and those leaving. Immigration to the UK was estimated to be 596,000 – comprising 268,000 EU citizens, 257,000 non-EU citizens and 71,000 British citizens. This included the highest level ever recorded of Romanians and Bulgarians – 74,000. Some 323,000 people are estimated to have left the UK in the year to September, up by 26,000 on the 12 months to September 2015. More British citizens left the country than foreign nationals – 128,000, compared with 103,000 EU citizens leaving the UK and 93,000 non-EU citizens.